Kiwano growing herbaceous vine of the genus Cucumis also known as Cucumis metuliferus, Kiwano annual and can grow in desert mediterranean, subtropics, temperate or tropics climate and growing in hardiness zone 4+. Leaves color green leaves become hairy mature, the shape of the leaves is heart. 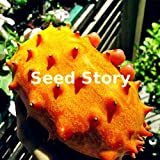 Cucumis metuliferus KIWANO HORNED MELON Seeds! 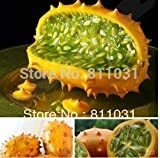 What can be done with big quantities of Kiwano fruits?